I had a huge performance this past weekend - the Rouse Oboe Concerto on my orchestra's final Masterworks concert. We all know that reeds can be unpredictable and that the need to actually craft a crucial piece of your instrument can be a huge stressor, so my goal was to take that piece of the worry off the table as much as possible. How do you make sure you have the best reed possible on the big day? I've seen students and colleagues treat this problem in three main ways: saving, obsessing, and collecting. Some people discover a good reed, and immediately tuck it into the "special" reed case, the one that doesn't come out to every gig, and just wait for the "special" time to use it. They'll play their daily gigs and practice on "normal" reeds, withholding the "special" one for the big concert. Some people begin weeks in advance, trying extra hard with every single reed that they make. A basically good reed is not good enough, and they wreck potential reeds left and right trying to perfect their technique to make something that vibrates exactly right, articulates cleanly, stabilizes itself at precisely 440 - and until they find it they can't be dragged away from the reed desk. They'll go to bed disappointed every night because the perfect reed has still eluded them. I will admit that I see problems with both of these techniques. Reeds change over time, and they change from venue to venue, and the weather can change in ways that are outside your control. 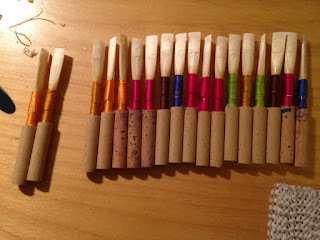 The reed you "saved" in mid-March might be unplayable by your concert in early April, and you've wasted weeks when you could have been happily playing on a good reed and continuing to work on more of them. And life is too short to huddle over a reed desk feeling frantic when you could be actually practicing your repertoire, or working on your breath support by exercising outside in the fresh air, or learning more about life and music by living and listening. Me, I'm a collector. I started three weeks ago to consciously add reeds to my case. I focus on quantity, on the presumption that quality will take care of itself. It's also the case that in my life I can't count on knowing what reed I need from one gig to the next, since every venue is different, and I knew I wouldn't be in the Morris Performing Arts Center until a few days before my performance, which is too late to reliably make from scratch the exact reed I knew I would want. Since I'm such a high volume reed-maker, that conscious ramp-up of production specifically meant that in each batch of reeds I wound, I put two instead of one on the premium cork tubes that I use for myself. I'm not averse to using a reed built on synthetic cork, and I'll proudly play on anything that is up to the task - but I know from experience that my own best reeds usually emerge on a Pisoni tube, so that's what I pushed. Someone who makes one reed a day might double it, to two. Someone who orders three per month might make it five for the two months before their event. The point is to have many choices and to have time to break everything in so you know what you have. As I finished each large batch, I consciously chose more reeds for myself than I normally would have, and practiced on them in rotation. In normal times, I add maybe two new reeds each week to my case (retiring older ones as I go) - but for the past few weeks I pulled a new one each day and practiced on it and finished it to my liking. I was also conscious of keeping older reeds which still had life, though I am always unabashed about removing and breaking off reeds which have functional problems or which don't make me happy for whatever reason. Some days, the new reed didn't work out, and some of the nearly-finished ones got sold out from under me, but when I began this final busy week (eleven rehearsals and performances, including four full run-throughs of the concerto, three meetings, eight students, regular reed shipments), I arrived at the first rehearsal with 22 good reeds in my case. Some were older, most were newish, and I had had satisfactory practice sessions on every one. It turned out that in the hall, in front of the orchestra, I needed bigger, beefier reeds than I would have expected, and I was happy that I had a wide selection to choose from. It also turned out that I wanted the softer, older reeds desperately, for the other works on the concert and for the quintet services in the daytimes - and I had what I needed. On the whole I would say that I was perfectly happy with my reed options for the week. On the whole I would say that I was perfectly happy with my reed options for the week. That's such an unusual sentence for an oboist that I had to repeat it. Three weeks of active collecting brought me to a place of security, and this is a technique I recommend for any major oboe event.